A treat for your own home, or a gift for a special friend, Chart Art also makes a great gift for those ever-tricky-to-buy-for men and boys. Free delivery in UK. Deadline for orders to be delivered by Christmas is 12 December. Browse our paper charts, then enter the chart number and description in the configuration box when ordering. If you can't find the chart you need on our site, but you know the chart number enter that anyway and we will be able to get it. If you don't know the chart number give us a call (0191 646 1000) and we will find it. Chart Art is produced to order and delivery time is up to 10 days from ordering. Deadline for orders to be delivered by Christmas is 12 December. Chart Art is printed onto high quality 100% cotton canvas and stretched over the finest genuine artists stretcher bars complete with stretching wedges ready for you to hang. Hanging kits are supplied with all Chart Art canvas so putting them up on the wall is easy. The Canvas hanger incorporates a cut-out which allows the canvas to be hung on a standard two pin picture hook, which is also included. Using the included kit ensures that the canvas is “pulled” flush to the wall on a secure fixing. 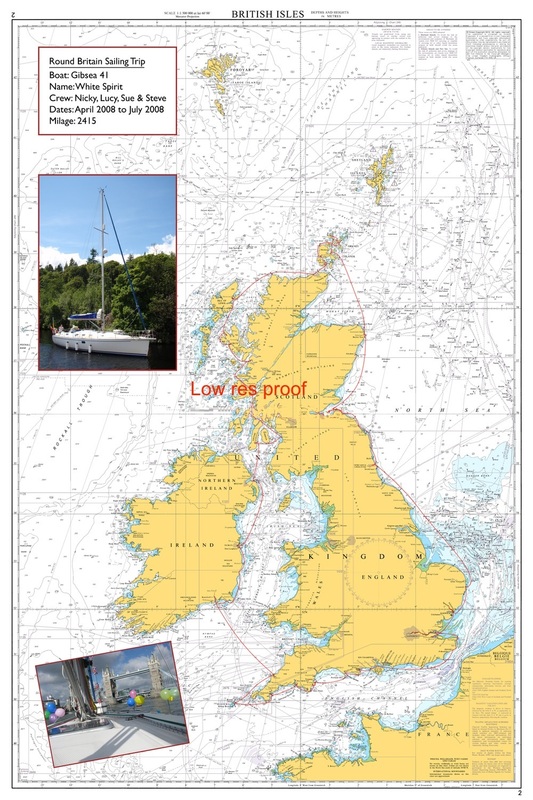 Chart Art is produced under license from the UK Hydrographic Office, however there are some Admiralty charts (non UK waters) which include data owned by foreign Hydrographic authorities and prints of these may only available after paying an additional licence fee. The same appplies to other charts such as Imray. In this case contact us for a price. The printing process uses technologically advanced 12 colour UV ink printed onto the finest 100% Cotton artists canvas, which is sourced from some of the biggest international art suppliers. Museum Quality Artists Stretcher Bars are made of the finest quality European kiln dried knotless pine, which has the advantage of being extremely hard wearing and not susceptible to warping that cheaper woods are prone to. Each bar features a rounded back edge which is designed to ensure that the canvas is always kept a full 1⁄2" (13mm) above the stretcher bar to ensure that there can be no ghost impressions on the canvas. These stretcher bars also incorporate ‘wedges’ which are placed in each corner and allow the canvas to be stretched extremely tightly over the frame. It also allows the canvas to be restretched over time, which can be of particular importance for the larger sizes. The standard UKHO chart is designed for use on the sea, for vessels approaching and leaving ports and avoiding the obstacles along the coast. ChartArt is more about displaying the coast and its relation to the sea, so sometimes you only want to see part of a chart or a specific island. No problem – we can crop into any chart to show just the area you want, be it the whole of the Hamble River or a special bay in Ireland we can probably work out a way to do it. Please call (0191 646 1000) or email to discuss your requirements. Recent order just delivered: "it arrived this morning and all looks good. Thank you. Regards, Nicky"
Ordered a Chart Art print of the Chichester Harbour part of Langstone and Chichester Harbours for my husband's birthday.